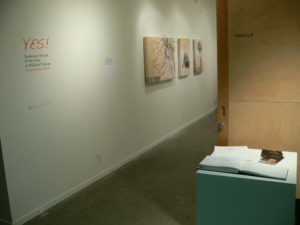 The SALT project is an installation of the work of three artists; Vancouver artist’s Haruko Okano and Nicole Dextras and Nelson artist Julie Castonguay. The artists worked with curator Deborah Thompson towards the creation of new work which explores the relationship between matter and impermanence. The work of the artists changes throughout the exhibition as their installations grow, evaporate and transmute taking the viewer through stages of death and move us towards renewal. Central to this show and essential and symbolic of Kootenay life, the Kokanee Glacier alpine wilderness has inspired visitors and residents for over a century. The history of the Kokanee Glacier and the Kootenay’s signature Kokanee Glacier Park will be the subject of this historic exhibition featuring quality unpublished photography from the early 20th century as well as recent imagery. From First Nations beginnings to silver mining glory, from pioneer alpinists to community preservationists, from the disappearing glacier itself to generations of Park Rangers, from the National Ski Team’s first summer training camps to avalanche tragedies… Kokanee’s stories will be told. 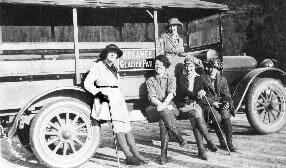 Historic photos from the Gordon Fleming Collection, taken by Kokanee Mountaineering Club official photographer Ross Fleming in the 1920s will be a notable heritage feature of this exhibition. 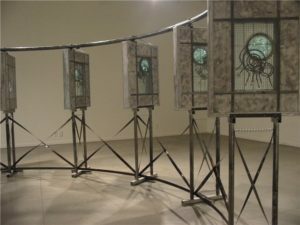 FLOW is an installation in found metal and glass inspired by the condition of the fresh water resources of the Columbia Basin. The design features the artist’s interpretation of a hydroelectric turbine. In this controversial time of privatized run-of-the-river hydroelectricity projects, in which there are substantial river and creek diversions proposed and in progress FLOW provides an opportunity for discussion about the consequences such projects pose and the urgency for an appropriate regional strategy. Brent Bukowski works with found objects— primarily metal and glass. His work is inspired by the observation of global, environmental patterns from the perspective of a secluded lifestyle in the mountains of the West Kootenays. His assemblages achieve a high levels of detail in which broken and cut glass are meticulously layered in and around metalwork. His sculpture has been exhibited across Canada and is included in several public, private and corporate collections. Stanley G. Triggs: Changes Upstream: Before and after the Libby Dam, 1969-72, is an exhibition of selected black and white photographs from the Shawn Lamb Archives by Nelson-born photographer Stanley G. Triggs. Stanely is a retired Curator of the McCord Museum of Photography at McGill University. 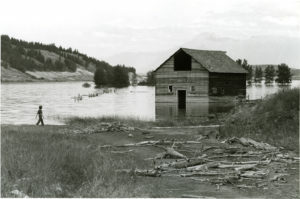 The exhibition documents the dramatic changes in the East Kootenay communities spread along the Kootenay River just north of the International Border between 1969 and 1972. Come celebrate the creativity and talent of this year’s graduating students from the Kootenay School of the Arts at Selkirk College. A group exhibition of contemporary art work from the studios of clay, fibre, metal and jewellery & small object design will be on display at Touchstones Nelson Museum of Art and History. Heritage homes and buildings are a significant part of Nelson’s cultural identity, and if you’ve spent much time walking around Nelson, chances are you’ll recognize more than a few of the houses depicted in the paintings you see here. These paintings could certainly be appreciated in another town or city, but that familiarity, that particular Nelson-ness adds a resonance and connection that would be missing elsewhere. These are portraits in the truest sense, but the sitters in this case are typically houses, not people. 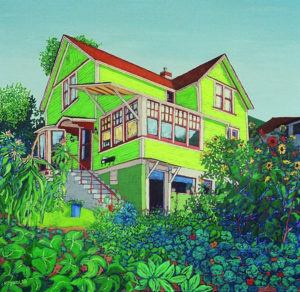 There is no morality or judgment here; these bright and lively paintings present an idyllic view of Nelson’s residential heritage, and document Carol’s vision as she walks our city’s neighbourhoods. In different ways, we are all “making our mark” as it were, both in the lives of ourselves and others. Architecture is often one of the more literal examples of this – tangible evidence of the people and circumstances that created it. 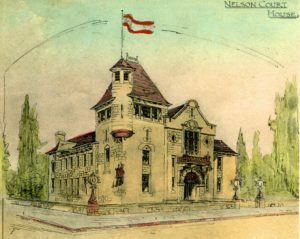 In Nelson, architecture has long been a prominent feature of our community. From the presettlement structures of the first nations to the Chako-Mika mall, it is an integral part of our civic identity. The “Memory Wall”, conversely, makes tangible the other end of the spectrum; some of the smaller but no less vital contributions and connections that are made in our community. Some of our strongest memories are quite small. Similar to architecture, however, they often have a strong connection to the place they happened. Where you got caught out in the rainstorm, rode a bike for the first time, liked to have coffee every morning. By gathering these memories on a map, it makes visible that connection to geography that we share with the buildings around us. 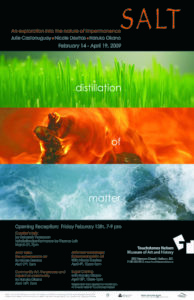 ROW: Reflections on Water is a thematic exhibition juxtaposing artifacts from the Touchstones Nelson permanent collection with works of art from contemporary artists in the region. 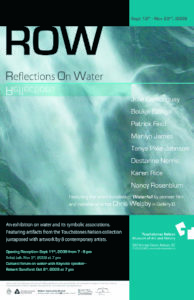 Through a variety of media, ROW creates narratives that investigate the symbolic, mythic and conceptual metaphors we associate with water. 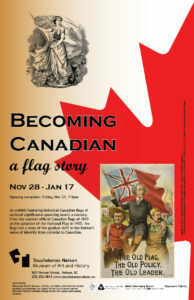 An exciting new exhibition, Becoming Canadian: A flag story opens at Touchstones Nelson: Museum of Art and History on Friday, November 27th from 7-9pm. On loan from a private collection, this exhibition documents through the use of historic flags the story of becoming Canadian. The exhibition spans nearly a century from the earliest official Canadian flags of 1870 to the adoption of the National Flag in 1965 covering the gradual shift in the Nation’s sense of identity from colonial to Canadian. The exhibition features rare examples of early flags as well as selected memorabilia and propaganda that accompanied the evolving symbols of identity that lead to our current red maple leaf. 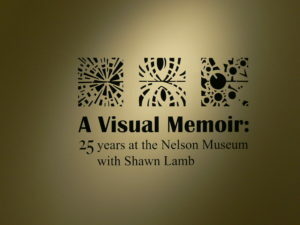 This exhibition in Gallery B celebrates and gives thanks to Shawn Lamb’s exceptional work for the Society. Set to coincide with Her retirement as Touchstones Nelson Archivists and Collections Manager this coming January, this exhibition is a selection of photographs, paintings and artifacts from the permanent collection chosen by Shawn to illustrate some of the stories and highlights of Shawn ‘s memories from the past 25 years.